Bubbie: (n.) [yiddish] grandmother, also bubbe ----- My bubbie passed away at the age of 92, and being from the south I always called her "Bubba". She was an amazing women, integral in my life, and one of the best cooks/bakers I've ever known. I inherited piles of her hand written recipes. 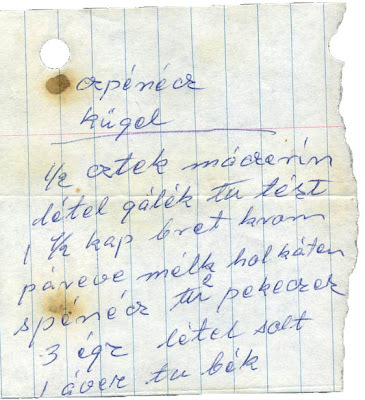 They are mostly lists of ingredients, and written in a phoenetic Hungarian/English mish mash. "Translating" and making these recipes is going to be a big process!! When my wife and I had our first anniversary we decided that we were going to go with the traditional anniversary gifts. As you may or may not know, the first anniversary gift is paper, which sounds fairly boring, but has been my favorite of the three that we have celebrated so far (paper, cotton, leather). My bubbie had passed away about 6 months prior and she compiled some of her recipes into two cookbooks with as much as she could translate. That is really when and where this project got started, so that is where I'm starting now. It's definitely two packages of spinach ("spinecz tu peckeczes") and a full carton of non-dairy creamer ("hol katen"). I find the easiest way to translate these is to just try saying them out loud to yourself repeatedly until things start making sense. I think you are probably right Sam. this is really beautiful. I can imagine my bubbie writing her recipes the same way. loved it and will make this for Shabbos. An avid cook, photographer, and IT professional. Born and raised down south in Nashville and settled in the Philadelphia area.